Hannah is completely sick of family gatherings and reunions. The only things that her family talks about are the past, the past, and the past. It already happened, so why talk about it? Hannah and her family are Jewish, and her family is celebrating the Passover Seder when Hannah is asked to open the door for the Prophet Elijah. Hannah opens the door that should lead to the hallway outside the apartment they were celebrating in, but instead of a hallway there is a grassy green field, and when Hannah turns around the fancy feast is gone. Her family has disappeared too. In their place stands a small polished table with few things on it. Opening the door has transported Hannah to a new place. Where is she? And when? A woman's voice behind her says "Well? Is he coming?" Hannah turns around, confused, until the voice asks "So, Chaya, is Shmuel coming or not?" Chaya is Hannah's Hebrew name. Hannah is surely dreaming, she thinks. It must be the wine, Hannah thinks. It's giving me daydreams. Or possibly her family is playing some trick or prank on her. She decides to play along: "Whether it was a dream or an elaborate game, she'd show them all that she's a good sport" (24). Hannah meets many different people: Gitl, the woman who spoke to her; Shmuel, Gitl's younger brother who is getting married the next day; Fayge, Shmuel's wife-to-be; Yitzchak, a butcher; Yitzchak's two kids, Reuven and Tzipporah; and four girls that are her age, Rachel, Shifre, Esther, and Yente. Hannah quickly becomes friends with these girls. They all call her Chaya. "Gone were her braces. Gone was the light coral lipstick her mother had allowed her to wear to the Seder. The girl who stared back had the same heart-shaped face, the same slightly crooked smile, the same brown hair, the same gray eyes as Hannah Stern of New Rochelle, New York, in America. But there was something old-fashioned and unfamiliar about this Chaya Abramowicz, something haunting..." (44). The wedding procession for Shmuel and Fayge is full of lots of music, singing, and dancing, but as they arrive at the synagogue, they see that there are military trucks parked in front of it. These trucks belonged to Nazis. Now Hannah finally realizes what is going on. She had been transported back to 1942, in the middle of the Holocaust, and she is a Jew. Someone else, but still a Jew. 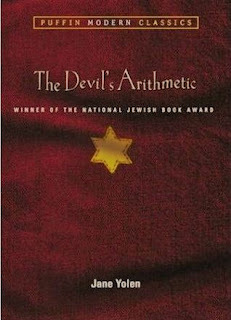 Like Making Bombs For Hitler (click to read my blog post on that book), The Devil's Arithmetic is about a young girl (in this case thirteen) who is pulled into the horrors of World War II. But unlike Making Bombs For Hitler, this book is even less gentle with explaining everything. Making Bombs For Hitler might be fine for some younger readers, but this book would probably send those same little kids running and screaming. Don't get me wrong, this is a great book, it's just not for little ones. 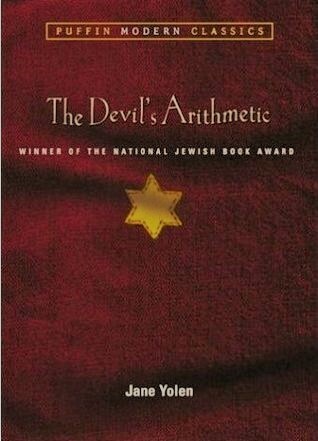 The Devil's Arithmetic is shorter than 200 pages, yet in that small space it explains about what life was like for many Jews during WWII. The concentration camps, the gas chambers, the ovens. The brutal Nazi guards. This is especially hard for Hannah, who meets an elderly family member (in Hannah's time) as a young girl (in Chaya's time) in the camps, and has to make a difficult choice. I'd say this book is almost more like historical fiction/horror than just historical fiction. If you are a parent, please read this before giving it to your kids. And be happy that opening a door won't transport you to the middle of a war. Daddy's Afterthoughts: I am delighted that Julia is starting to read multiple books on the same theme. This book couples well with Making Bombs for Hitler, as she already mentioned, in terms of their historical time period/milieu, etc... But it also uses the "young person who is transported to another time/place to learn an important lesson" trope that defined her recent reviews of The Lost Track of Time and The Phantom Tollbooth. As a former secondary school English teacher (I taught grades 7 and 9-11 for fifteen or so years, before switching to college teaching), I was always keen to get my students to recognize connections between texts, or between texts and life, or both. I'm glad that she is doing this on her own. One of the advantages of reading a lot is that students get to experience this, instead of simply being told by a teacher in a class somewhere that the connections exist out there. So that's my lecture for the day. This book is an emotional read. (There is a twist at the end of the novel - I won't give it away, but since Julia did not really tease it, I will - that is the payoff for the whole book, and it will bring tears to the eyes of any sympathetic reader, as well as a stunned "Wow.") Other than the high drama/tragedy factor, there are a lot of Hebrew and/or Yiddish terms and names that pepper the text that non-Jewish readers will not be familiar with, nor perhaps even be able to pronounce. Other authors in similar situations have been kind enough to provide glossaries of unfamiliar or novel terms, or at least pronunciation guides (see Burgess's A Clockwork Orange - a book that is definitely NOT NOT NOT for kids - or Frank Herbert's Dune for examples). Jane Yolen did not, at least in the version we read. So there may be a bit of a learning curve. But that's okay. A lot of learning can come from this book. Julia(and Dad) I am so glad to see you are reading age appropriate books. As a former Bookseller and now retired minister, I have been fascinated by the books you have chosen and the way you have reviewed them. (and by the way, I’m 61 and I love to read and review all sorts of books. My spouse calls me an Avocational Reader, which I think means reading keeps me out of trouble.